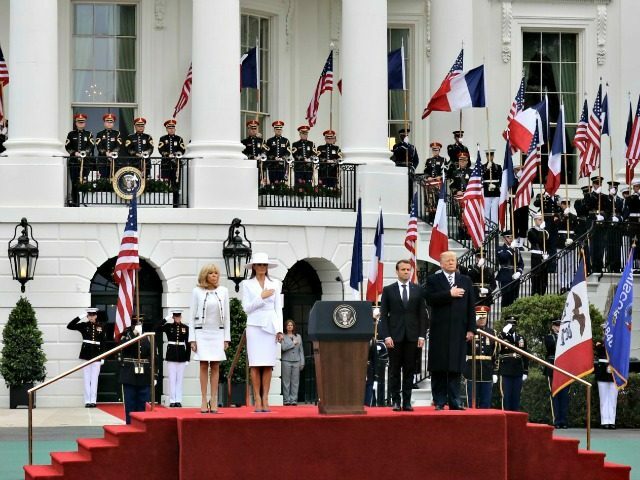 United States President Donald Trump and First Lady Melania Trump welcomed French President Emmanuel Macron and French First Lady Brigitte Macron with a grand military demonstration on the White House south lawn that featured the firing of cannons and playing of each country’s national anthem. 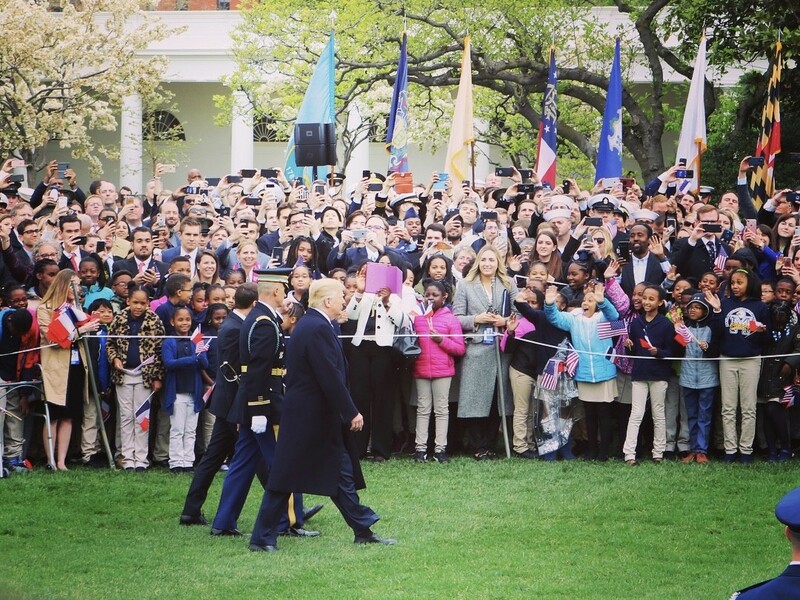 The U.S. first couple welcomed the French first couple in front of crowds of people and members of all five branches of the U.S. military. 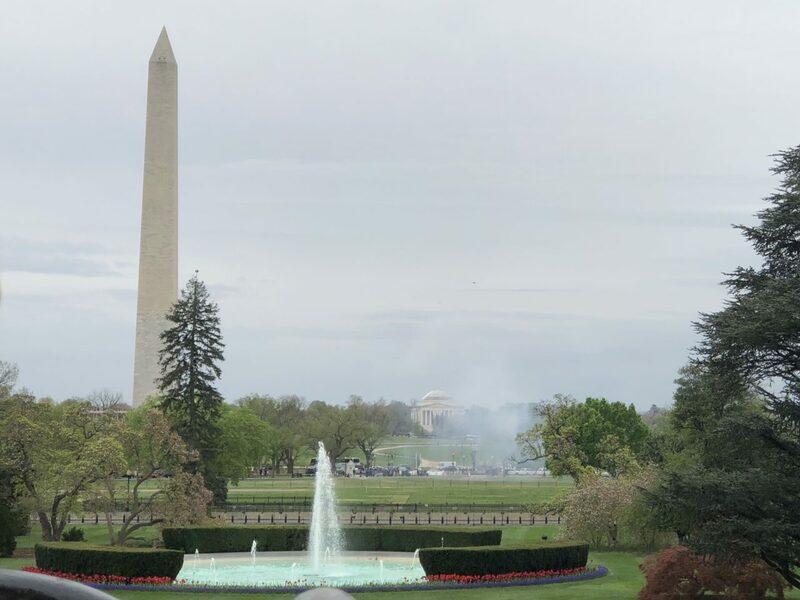 The French President joined President Trump fir reviewing the troops in a traditional demonstration and for overseeing the firing of cannons that appeared positioned closer to the Washington monument. 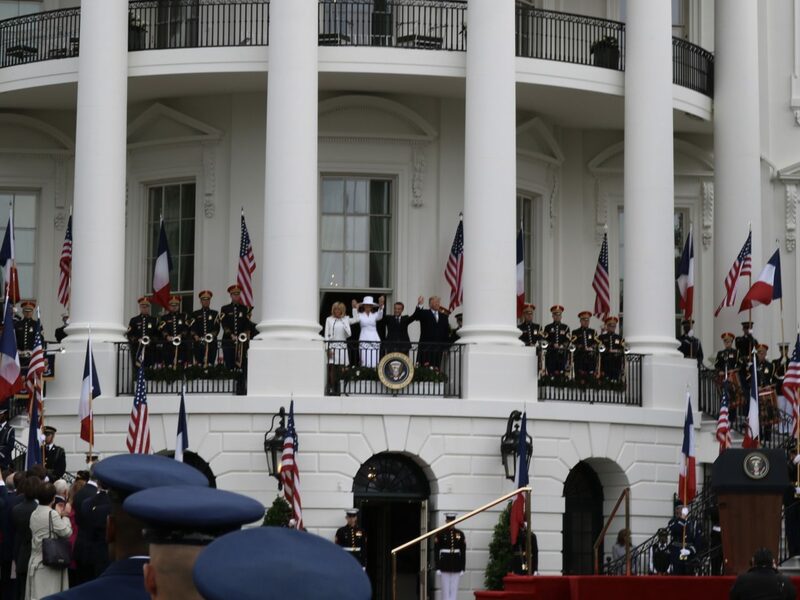 After the playing of each nations’ anthem, the Presidents offered welcoming remarks that reveled in the longstanding friendship between the United States and France – one forged in the American revolution. Trump offered sympathies to the Canadian people and victims of the Monday van attack in Toronto. They each also offered well wishes to recently hospitalized former U.S. President George H.W. Bush. President Trump then thanked both France and the United Kingdom for partnering with the U.S. in striking Syrian regime chemical weapons targets. Trump remarked that the friendship between the two countries was “forged in revolution” and persisted through WWI and WWII. 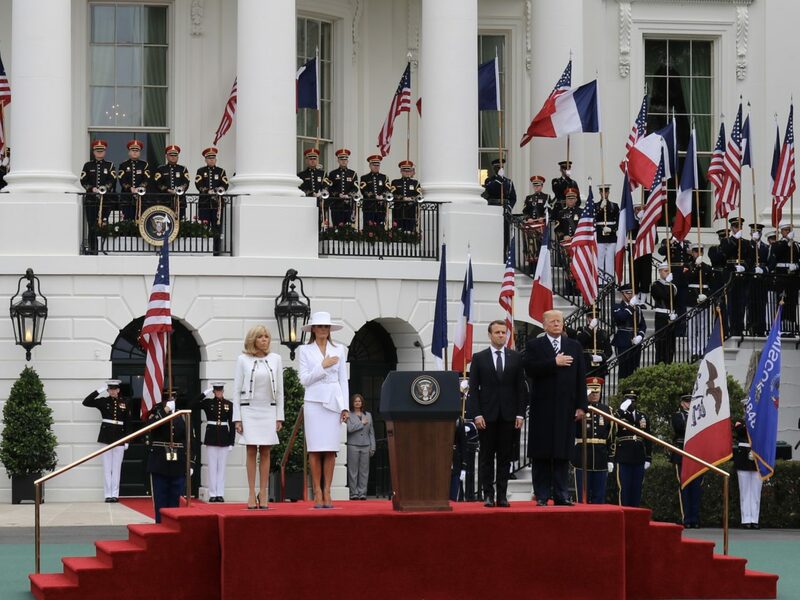 President Macron then took the podium with thanks for the warm welcome, echoing Trump with condolences from France for the Canadian people and sympathies for former President Bush and his family. Macron also spoke of the Marquis de Lafayette, but rather of his return to the United States 30 years after America’s Revolutionary War. The French President said, according to the translation of his words from French, that “America represents endless possibilities” for France. “It is said that France has renewed with the optimism it sometimes envied the United States,” he continued. Macron told the crowd that on Monday night at George Washington’s Mt. Vernon he had seen a key to the Bastille Prison that had been gifted to Washington from Lafayette. He also spoke of the Belleau Wood oak tree the Macrons gifted the Trumps and planted at the White House on Monday. “It is together that the United States and France will defeat terrorism,” Macron said through a translator. He said the U.S. and France will “counter the proliferation of arms of mass destruction” both in Iran and North Korea. The French President spoke also of free trade, climate change, and “a new strong multilateralism that defends pluralism and democracy in the face of ill winds,” according to the translation of his words.